This primer – about a hundred pages in length - can serve as a handy guide to help you get a solid hold on the concepts of Life-Cycle Costing Analysis (LCCA or simply LCC). 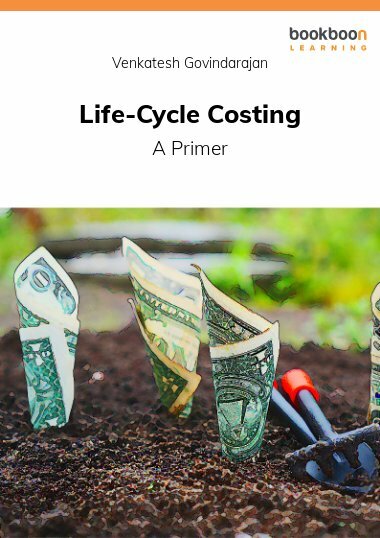 This primer – about a hundred pages in length - can serve as a handy guide to help you get a solid hold on the concepts of Life-Cycle Costing Analysis (LCCA or simply LCC). Students of engineering will at once recognize the importance of this weapon in their armory, when you will, almost certainly, be handling ‘sustainability-related’ issues in your career. G. Venkatesh, ME, MSc, PhD, born on 13/01/72 in Chennai (India), is Associate Professor at the Department of Chemical and Engineering Sciences, Faculty of Health, Science and Technology, Karlstad University, KARLSTAD, Sweden. Prior to this publication, he has published ABC of Sustainable Development and Environmental LCA – A primer, with BookBoon; and Water for all and other poems, with Cyberwit (India).